The Horstmann Technique is a bodywork therapy consisting of several processes. It was developed in the mid 1990s by Australian Natural Therapist, Trish Trowbridge. Horstmann was Trish’s birth name. After more than ten years of practicing a variety of Natural Therapies including Remedial Massage and Herbal Medicine she had a Near-death experience in November 1991 which left her with expanded intuitive and visionary abilities. The Ileo-Sacral Release was the first technique which she accessed in a transpersonal vision in 1995. It remains the core therapy of the many she has since brought to the world. Most people have unacknowledged hurts, unexpressed fears and unhealed structural strains and injuries which they ignore or “stuff away” in their unconscious mind. Trish agrees with the ancient oriental philosophy that these blocked negative energies contribute to people’s lower back problems. These energy blocks, held in the sacrum area, can cause problems such as postural misalignment, imbalances in biochemistry and behavioural responses. They can produce disharmony in the body’s subtle energy system which can predispose us to illness and accidents. This technique is remarkably effective in releasing these blocks, often giving immediate relief. The Horstmann Technique is “vibrational medicine”, an energy-based bodywork therapy which is simple to learn but quite precise. 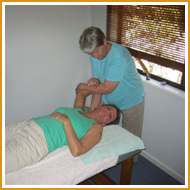 The practitioner holds specific points on the client’s clothed body while mobilising their leg, arm or foot. Anyone who is caring, dedicated and with some sensitivity to subtle body energies can learn and become proficient with these healing processes. In 1996, within months of completing her clinical testing of the technique on herself and many clients in the small NSW rural village of Crookwell where she lived, Trish began seeing many people for therapy sessions in Sydney. She registered The Horstmann Technique as a trade name and began teaching workshops. Trish, and the teachers she trains, are assisting many therapists as well as lay people to learn this simple healing skill. In 2008 she released her book about the Horstmann Technique, The Horstmann System – From Philosophy to Practice.